Coyotes howl, yelp and bark. Howling is a communication with others in the area. Males will howl to warn other males to stay away from their area, or invite females in. A coyote answering the howl will be signifying where his territory is, so there is not a conflict. 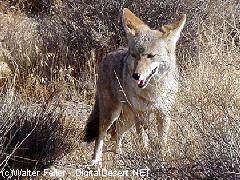 Yelping can be a sign of excitement or a criticism amoung a small group of coyotes. This can heard often during periods of play amoung pups. Barking is heard when the coyote is threatened, if a den of pups is in danger or protecting a kill.